Currently being documented in the studio: Bluebottle Fly Woman, a recently discovered Homo-insecta. 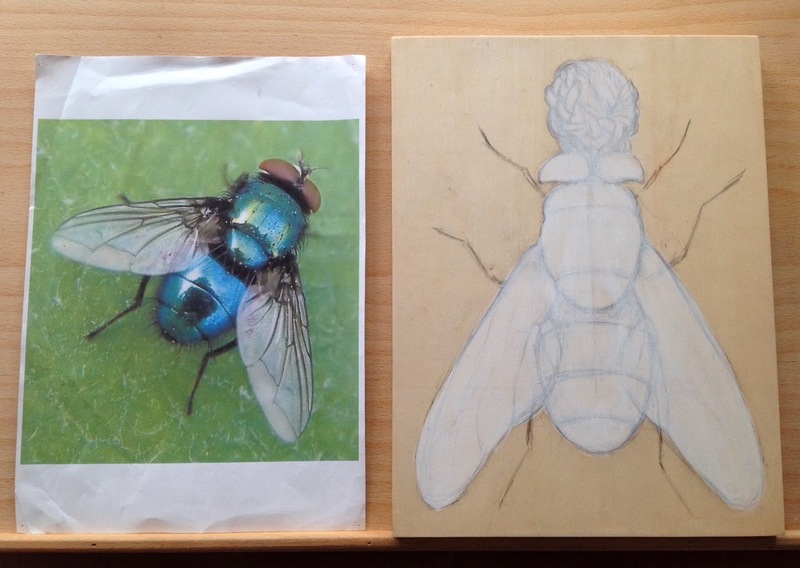 She evolved from the Northern Bluebottle fly, a species of common Blow Fly (scientific name: Protophormia terraenovae). 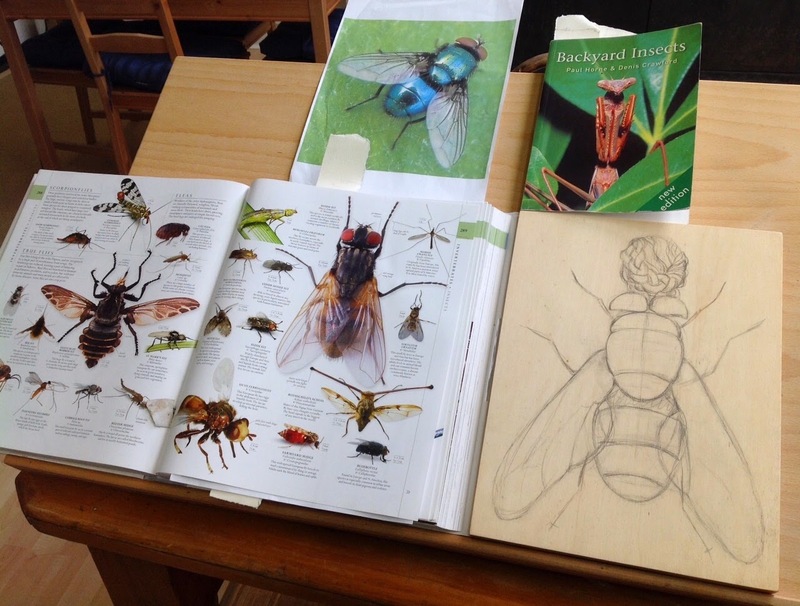 More about these much-maligned flies can be found HERE. Several stages up the evolutionary scale from pesky (and exceedingly stupid) Blowies, Bluebottle Fly Woman is not only beautiful, but also extremely bright. In April 2015 an enlightening and stunningly photographed documentary, The Great Australian Fly screened on Australian ABC television which corrected a number of misconceptions about flies. For details, go HERE. Pictured below: Initial stages of Bluebottle Fly Woman, 2015, pencil, gesso and acrylic on wood, 32 x 30 cm. The Homo-insecta Plusiotis victorina Beetle Woman (captured in the newly completed painting directly above) evolved from a species of jewel scarab that is native to Mexico. 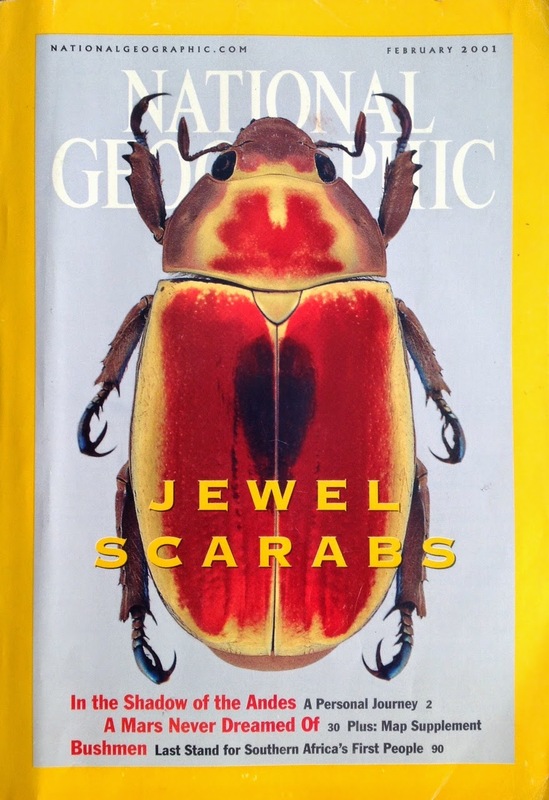 Respectively above and below are the front cover and a double page spread from an old copy of National Geographic (February 2001) that I recently unearthed in a Melbourne thrift shop. 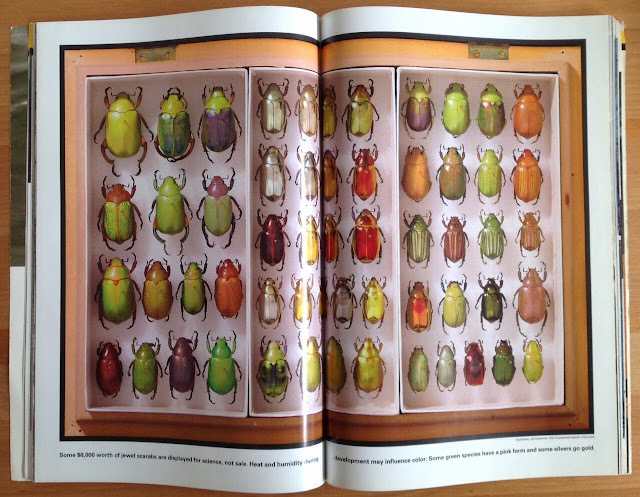 It will give some idea of the shimmering beauty and extraordinary diversity of these insects. Plusiotis victorina can be seen first on the left, second row from the top. A visit to the University of Nebraska’s Division of Entomology website is highly recommended. 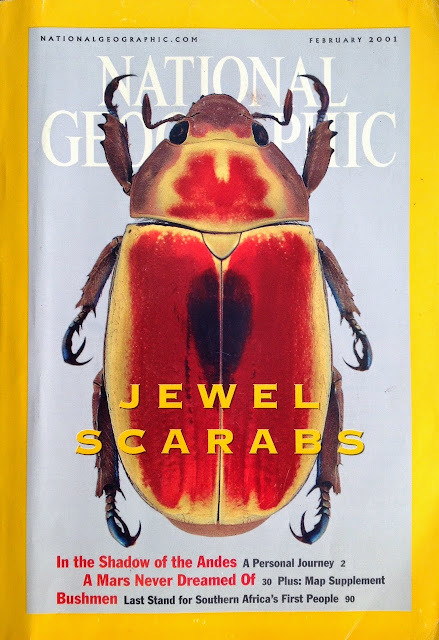 For a more detailed view of individual Scarabs, go to their web page: Generic Guide to New World Scarab Beetles. A page devoted entirely to Plusiotis victorina (AKA Chrysina victorina) is HERE. Aside from the technical issues mentioned in my last post, which I’m certain are not insoluble, I'm finding painting onto wood extremely satisfying. It feels very much as if the materials are working with me, not against me. As outlined previously, and as demonstrated by the following progress views, colours have been carefully built in transparent and semi-transparent layers before adding details. The metallic areas of the chitin (protective outer casing) and legs have painted with metallic gold over brown, gradually building to warmer coppery tones with applications of transparent orange and browns. Pictured above: progress views of Plusiotis victorina Beetle Woman, 2015, acrylic on wood, 32 x 22 cm. 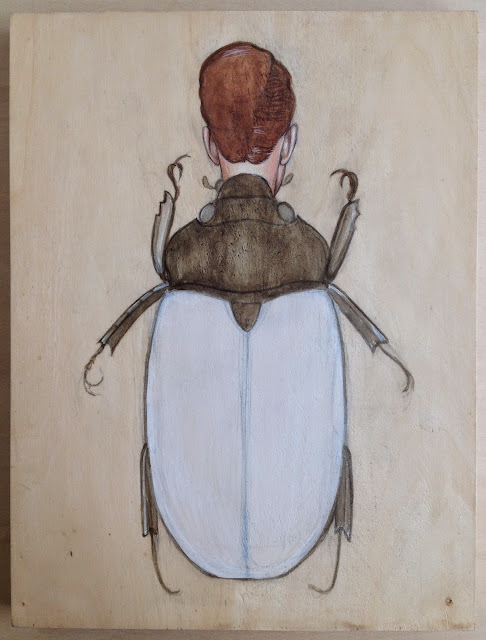 The current Homo-insecta paintings on wood are companion pieces to the watercolours (2014 - present) that I’ve put on temporary hold while I get this series under way. 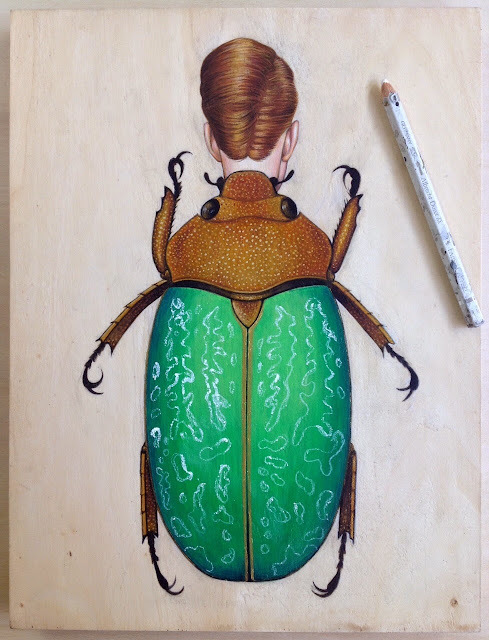 As mentioned in a previous post, this is not the first time I’ve painted on wood. In past times, however, the surface was prepared with two or three coats of gesso, with a light sanding (using a fine-grained sandpaper) in between each layer. The preparation of these panels is similar, except that instead of gesso, the wood is coated with a clear primer, resulting in a protective, non-darkening surface which retains the subtle wood grain. 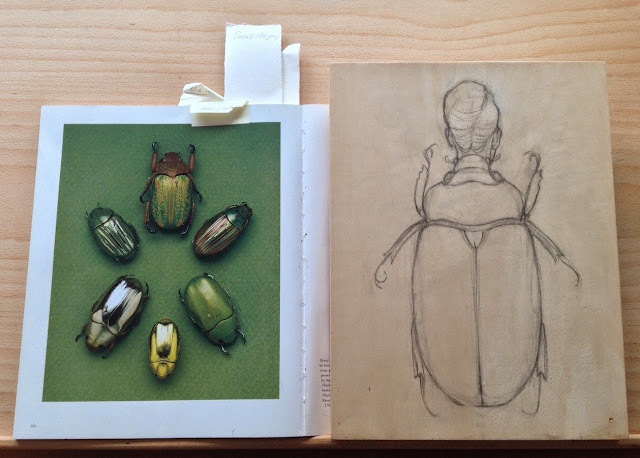 After the figure is outlined in pencil, 2 – 3 coats of gesso are applied to the image area, through which the outlines of the drawing remain visible. The first paintings on small square panels measuring 20 x 20 cm were essentially an experiment to get a feel for this new method of working and, as much as possible, learn to deal with any technical challenges it might throw my way. 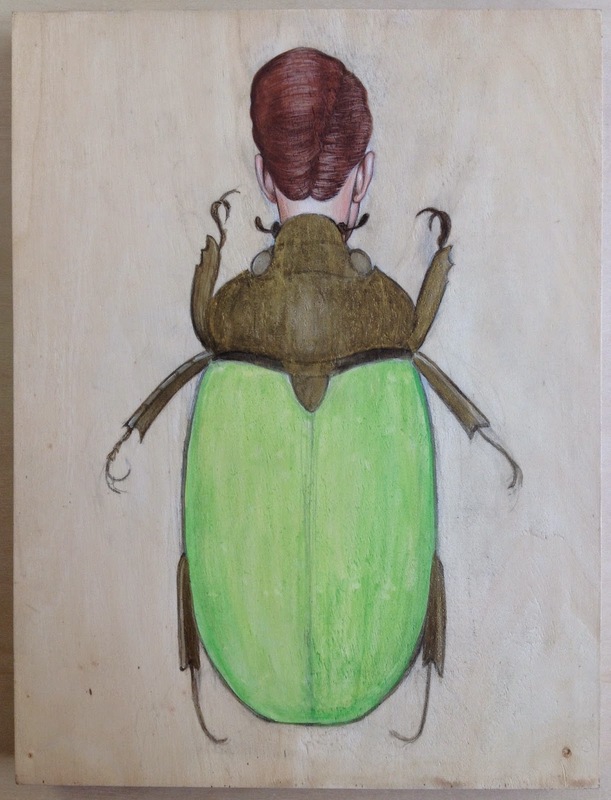 Plusiotis victorina Beetle Woman is the third Homo-insecta to be painted on a panel measuring a slightly larger 32 x 23 cm. 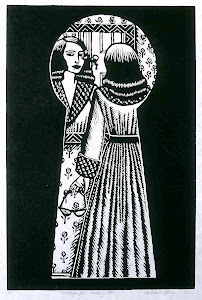 Still at the relative beginning of a wide, frequently daunting learning curve, I’ve learned some key lessons from my previous efforts – principally, the necessity to work with even more than usual care, leaving very little to chance. The exposed wooden surface is particularly unforgiving in regard to pencil marks; if there are any mistakes in the drawing, or I simply want to make a minor adjustment, it is almost impossible to remove unwanted marks that fall outside the painted area. In many other instances, alterations and erasures (notably in the powerful large scale drawings of William Kentridge) can lend tremendous vigour to an image. 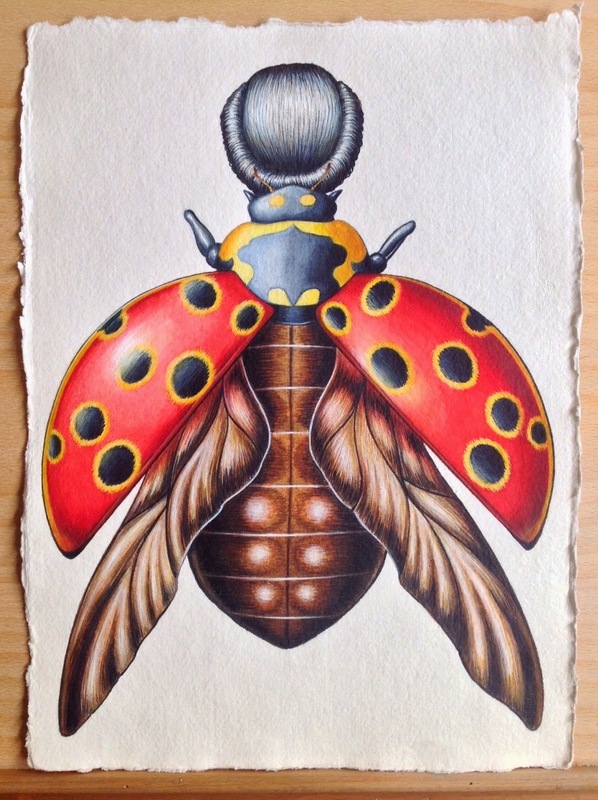 The Homo-insecta series, however, takes natural history illustration as its point of departure, and a meticulous aesthetic and sense of stillness is essential. Erasures and alterations merely make the image look grubby. The fast drying nature of acrylic paints can be a plus with smaller sized works, but as the scale increases, the blending of colours – for example, skin tones – can be extremely difficult. In the two stage views directly above, the first layers of colour have been applied. Painting wet-on-wet, a standard blending technique in oil painting, doesn't always work well with acrylics; all too often the paint lifts completely away. Instead, I'm gradually building areas of colour and tone via a series of thin washes, first making sure that each previous layer is completely dry. Started in 2014, but extensively reworked this year: Ladybird Beetle Woman, pencil and watercolour on Khadi Paper 41.91 x 29.72 cm. The changes are subtle, and not easily discerned in reproduction; the most significant difference is in her hair, to which I've added warmer tones. To see the earlier version of this work (including a series of progress views) go to Blog Post Tuesday 8 July 2014. Lately it seems to have been raining constantly at Ballarat. But there are compensations - like this exquisite raindrop-encrusted spider web recently photographed outside my studio. A remarkable feat of spinning and engineering, it was improbably suspended between our Hills Hoist clothesline and the vegetable patch, having weathered a particularly dramatic storm the night before. Unfortunately the weather didn’t improve much for last weekend’s Ballarat Heritage Weekend, an event my partner Shane Jones and I had eagerly anticipated ever since attending the festival for the first time last year. Fortunately, all the events we visited were indoors based, and all were simply wonderful. Our first port of call was the Ballarat Apron Festival, co-organised by our friend and neighbour, Heather Macleod (pictured below) who declared that she thought of us when she was ironing the aprons pictured above and below. Lent by a private collector, several were worn by the character Jean Beazley (Nadine Gardner) in the celebrated ABC TV series Dr Blake’s Mysteries, which, for the uninitiated, is set in late 1950s Ballarat. In turn, I thought of my friend, Arizona-based artist Deborah McMillion, who is also a devotee of the show. In the Ballarat Gold Exchange in Lydiard Street, it was a treat to finally meet artist/printer Lawrence Finn, Director of Hipcat Printery in Kyneton. Also in Lydiard Street, we joined a guided tour of the membership-only Old Colonists Association, where the fictional Dr Blake frequently calls in for a tipple. The tour guide informed us that the actor Craig McLaughlan, who plays Dr. Blake, recently became a member. After the tour of this magnificent building, which was founded by veterans of the Eureka Stockade, we stepped out on to the balcony to enjoy stunning views of historic Lydiard Street. Later in the day, Shane and I demonstrated what Doctor Blake tragics we really are by calling into the cozy bar for a glass of wine. Two highlights of the day were concerts at the Mechanics Institute: at 4 pm, The Pacific Belles, a dazzling Andrews Sisters-inspired trio (we immediately pronounced ourselves lifelong fans) and at 4.30, a solo performance by talented Creswick-based chanteuse Aimie Brûlée. Outside the Mechanics Institute, prior to the concerts, we bumped into Judith and Joel, two old friends we haven’t seen for several years. The four of us ended the day with a civilised coffee at the palatial Craig’s Royal Hotel (Mark Twain is its most famous guest) then going out for a meal and a further catch-up, followed by a solemn vow not to leave it so long until our next meeting. Meanwhile, Shane and I are already hanging out for the 2016 Ballarat Heritage Weekend. 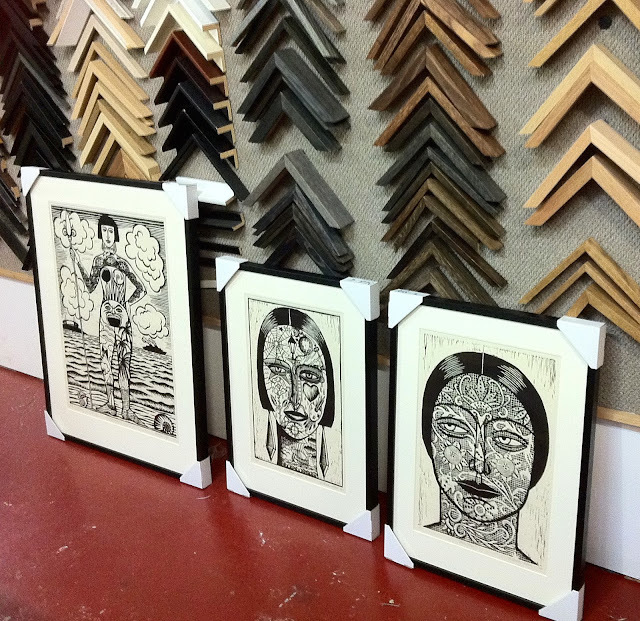 Snapped at the picture framer, Omnus, during a flying visit to Melbourne on Saturday: three linocuts from the vintage Tattooed Faces and Figures series, moments before they were cocooned in bubble wrap. 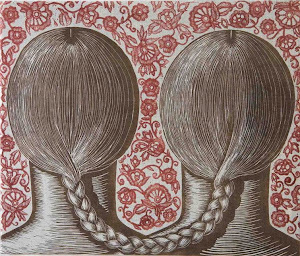 In August they will reemerge for Inking Up, a three-person tattoo-themed exhibition at Castlemaine Art Gallery and Historical Museum. The show will also feature linocuts by Rona Green and the exhibition's curator, Clayton Tremlett. (See also Blog Post, Tuesday, March 3). 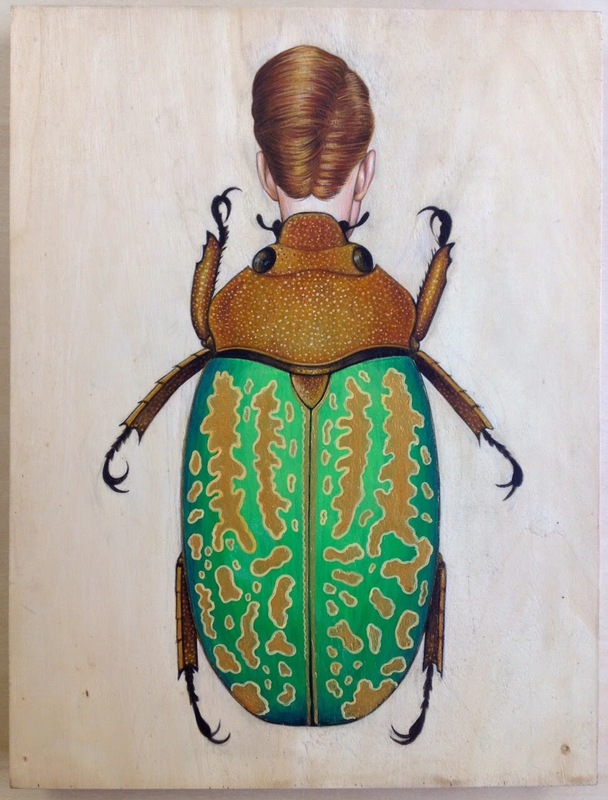 Pictured below: final stages of Apoderus coryli Beetle Woman, 2015, acrylic on wood, 32 x 23 cm. 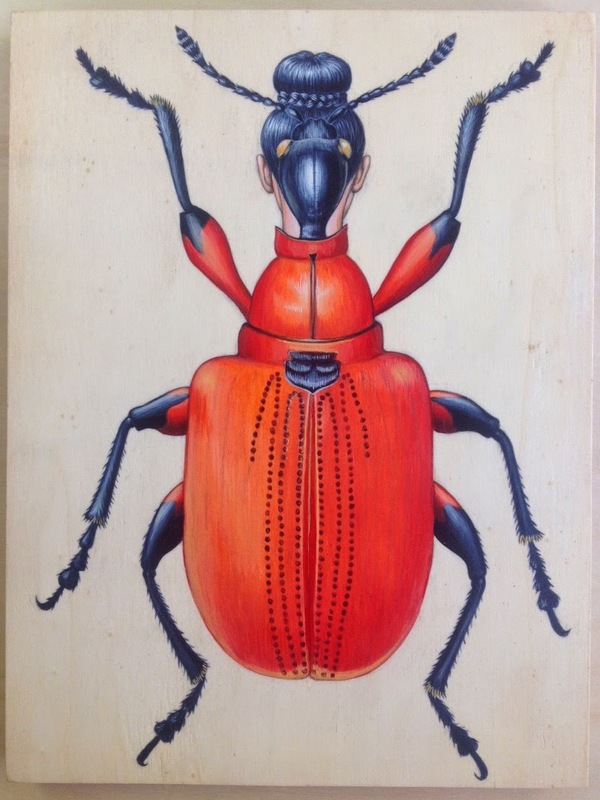 (For more about this Homo-insecta, see previous two posts). 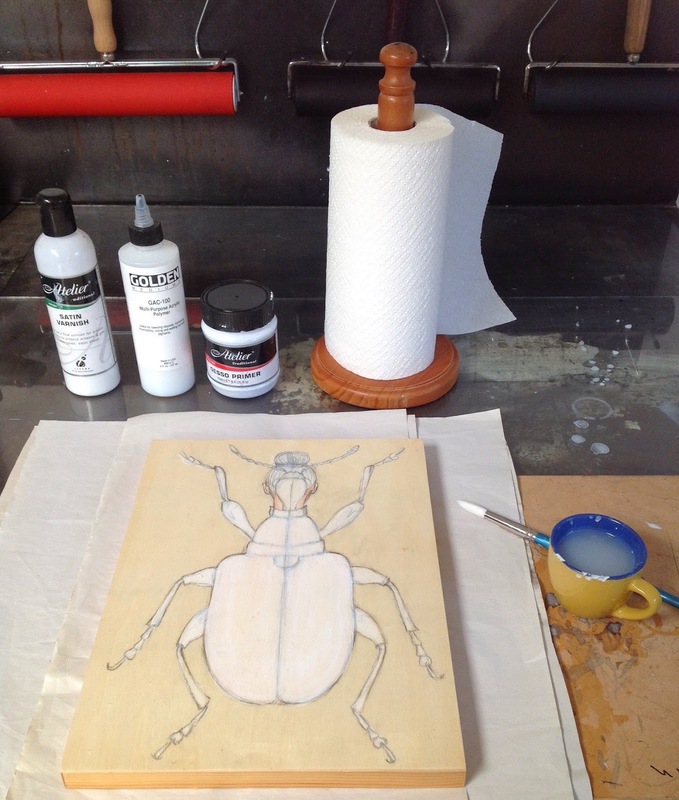 In the Ballarat studio I’m currently documenting the Homo-insecta, Apoderus coryli Beetle Woman. To see the European beetle from which she evolved (AKA Hazel Leaf-roller and Hazel Leaf-rolling Weevil) go HERE and HERE. Pictured above: interim stages of Apoderus coryli Beetle Woman, 2015, pencil and acrylic on wood, 32 x 23 cm. 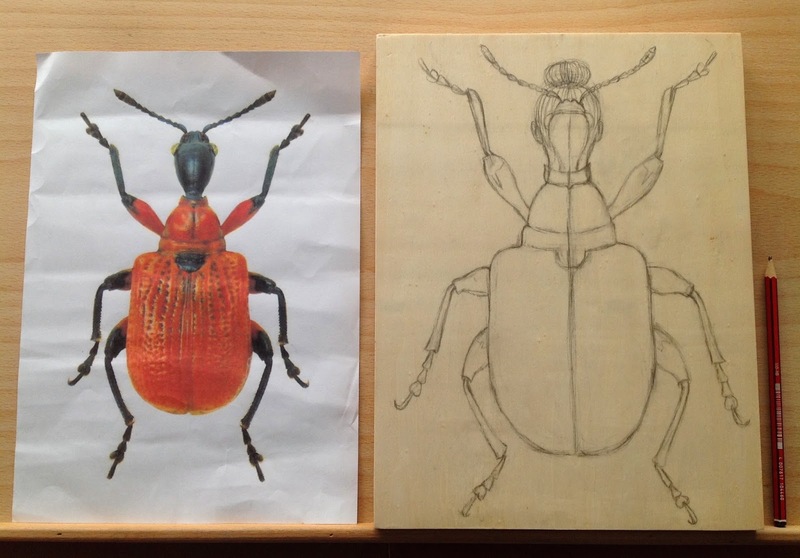 Pictured below: Preparatory stages of Apoderus coryli Beetle Woman, 2015, 32 x 23 cm. 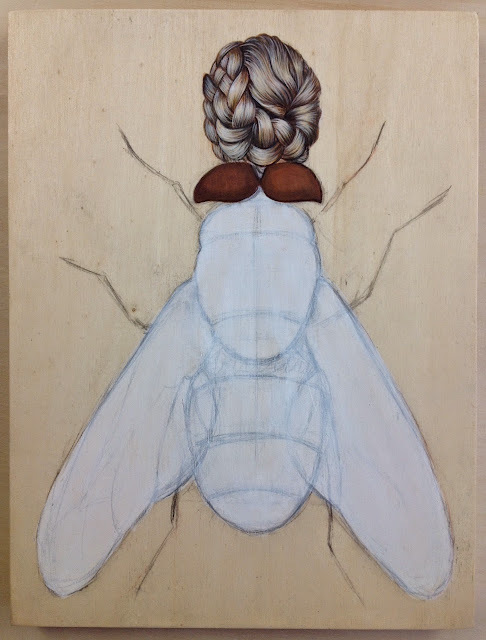 Top: pencil on wood; Base: pencil, gesso and acrylic on wood.